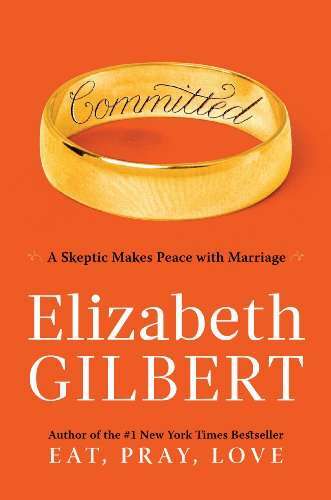 Since Valentine’s Day is in February, I thought the perfect book choice should be “Committed: A Skeptic Makes Peace with Marriage” by Elizabeth Gilbert. According to Elizabeth Gilbert’s Web site www.elizabethgilbert.com, “Committed” continues the story of Liz and Felipe, a Brazilian-born man of Austrailian citizenship who she met while on her trip to Indonesia with whom readers were introduced to when reading “Eat, Pray, Love”. Resettling in America, the couple swore eternal fidelity to each other, but also swore to never, ever under any circumstances get legally married. Both Felipe and Liz were survivors of previous divorces, but providence intervened one day in the form of the United States government which – after unexpectedly detaining Felipe at an American border crossing- gave the coup a choice: they could either get married or Felipe would never be allowed to enter the country again. Having been effectively sentenced to wed, Liz tackled her fears of marriage by delving into this topic completely, trying with all her might to discover through historical research, interviews, and much personal reflection what this stubbornly enduring old institution actually is. Committed attempts to “turn on all the lights” when it comes to matrimony, frankly examining questions of compatibility, infatuation, fidelity, family tradition, social expectations, divorce risks and humbling responsibilities. Gilbert’s memoir is ultimately a clear-eyed celebration of love with all the complexity and consequence that real love, in the real world, actually entails. I just finished the first chapter of “Committed” and Liz Gilbert’s prologue and found that I too don’t know what marriage is? Do I want to get married? Sure. Do I want a big wedding? Sure. But do I really know what marriage actually is? Can I allow myself the opportunity to share the rest of my life with someone, (THE REST OF MY LIFE) with one person. I’m not sure, but there is a romantic side of me that believes I would be able to do it, if he was the love of my life, as Felipe is to Liz in this book. I come from divorced parents where “love of my life” was not in either of my parents vocabulary, hell, I don’t even know if they actually loved each other as people. What I held on to, was the romanticism of love, (no prince charming on a white horse, but some one I could relate to on a mental level.) I know I sound corny, but I’ve always loved a good love story. Situations like Liz and Felipe’s are common, for generations men and women were getting married because they had to, whether it be because the woman got pregnant, one of the two people in the marriage were in a country illegally or your parents arranged it. It isn’t uncommon, but it isn’t a reason to get married, not at all. Which from the way I understand it, she is basically saying that intimacy between two people can only end up in a mess. I’m not sure how much I agree with her, I think any invested relationship is about taking the risk and sure can end up in catastrophe, but that’s a part of life. Until next time!